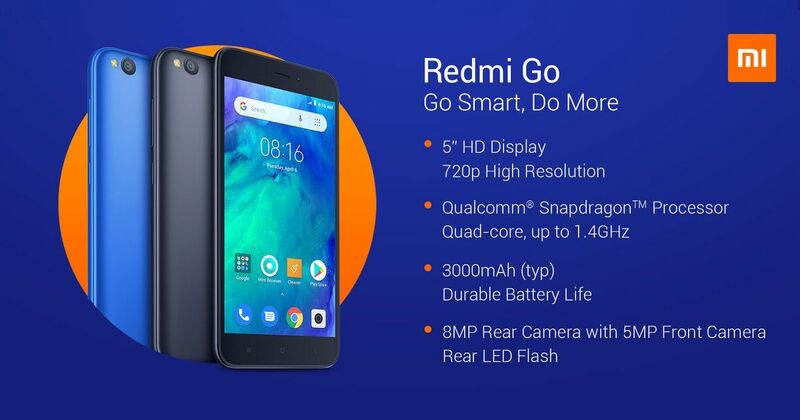 Redmi Go Phone is Now Official! - Playfuldroid! Without any fanfare, Xiaomi has announced the Redmi Go smartphone through an official tweet. The below shown official poster only confirms the key features of the smartphone. There is no official information available on the pricing and specifications of the Redmi Go smartphone. The Xiaomi Redmi Go smartphone is the first ever Android Go phone from the company. The handset features a 5-inch display that supports 720p resolution. The Redmi Go that is packed with modest specs seems to be wearing a polycarbonate body. It is fitted with a rear camera of 8-megapixel and a front-facing shooter of 5-megapixel. It features a battery of 3,000mAh battery. The phone is powered by a Snapdragon chipset that includes 1.4 GHz quad-core processor. The plastic-bodied phone comes in Black and Blue color choices. Popular tipster Roland Quandt has revealed through his post on WinFuture.de that the smartphone will be heading to the European markets with a price tag of 80 euros ($92). He also revealed key details on the specifications of the phone. The handset features 16:9 aspect ratio display that supports 1280 x 720 pixels. The SoC o the phone is supported by 1 GB of RAM. For storage, it has a microSD card slot and 8 GB of internal storage. Lastly, the smartphone is running on Go edition of the Android 8.1 Oreo OS.